There’s little doubt that most humans today are better off than their forebears. Stunningly so, the economist and historian Deirdre McCloskey argues in the concluding volume of her trilogy celebrating the oft-derided virtues of the bourgeoisie. The poorest of humanity, McCloskey shows, will soon be joining the comparative riches of Japan and Sweden and Botswana. Why Not the Conventional Explanations? What, Then, Explains the Enrichment? 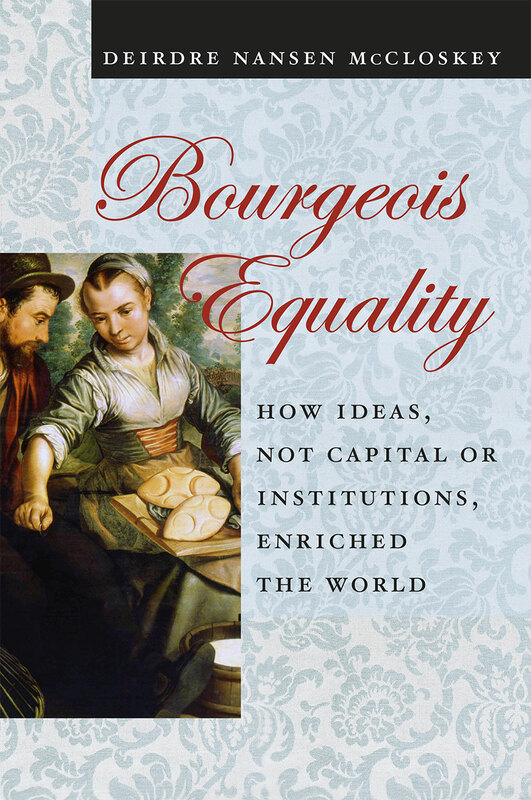 "It has always seemed to me that history is overdetermined, so any attempt to pick out a single cause will be doomed, and yet McCloskey's insistence on the essential role of what she variously calls ideas, ideology, ethics or rhetoric—the social acceptability of bourgeois folk engaging honourably in business—is persuasive. . . . Bourgeois Equality is richly detailed and erudite, and it will join its companion volumes as essential reading on the industrial revolution, as well as a model of the intellectual depth and breadth achievable through the study of economics." "A sparkling book. . . . McCloskey makes a convincing case."